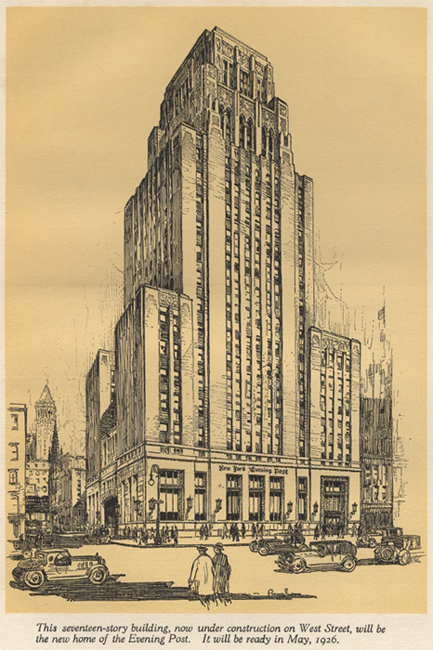 The three buildings shown here represent the home of the Evening Post from its first headquarters on Broadway and Fulton Street, completed in 1875, through its Art Deco skyscraper at 75 West Street. Founded by Alexander Hamilton in 1801, the Evening Post was edited by William Cullen Bryant for over fifty years after he became editor-in-chief in 1828. 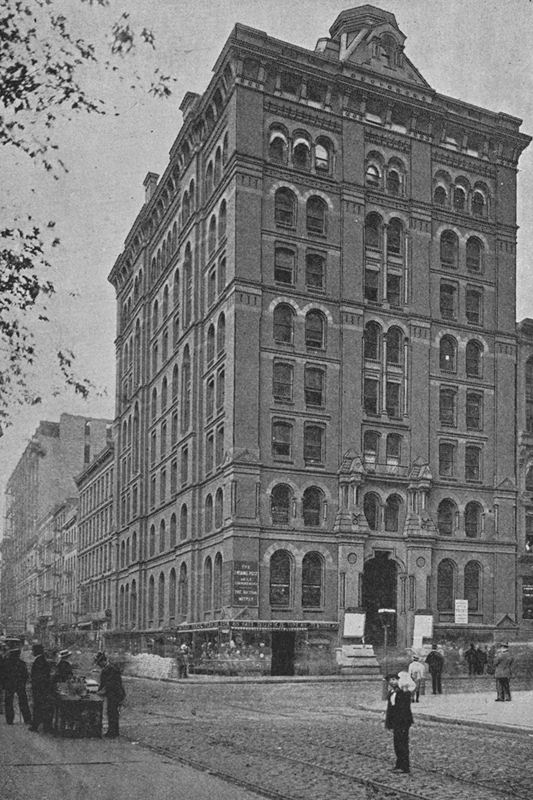 The paper's first major headquarters was a Romanesque-style, 10-story load-bearing structure with hydraulic elevators. The editors and compositors occupied the top floor while the printing press operated in the basement; intermediate floors were rented to tenants. 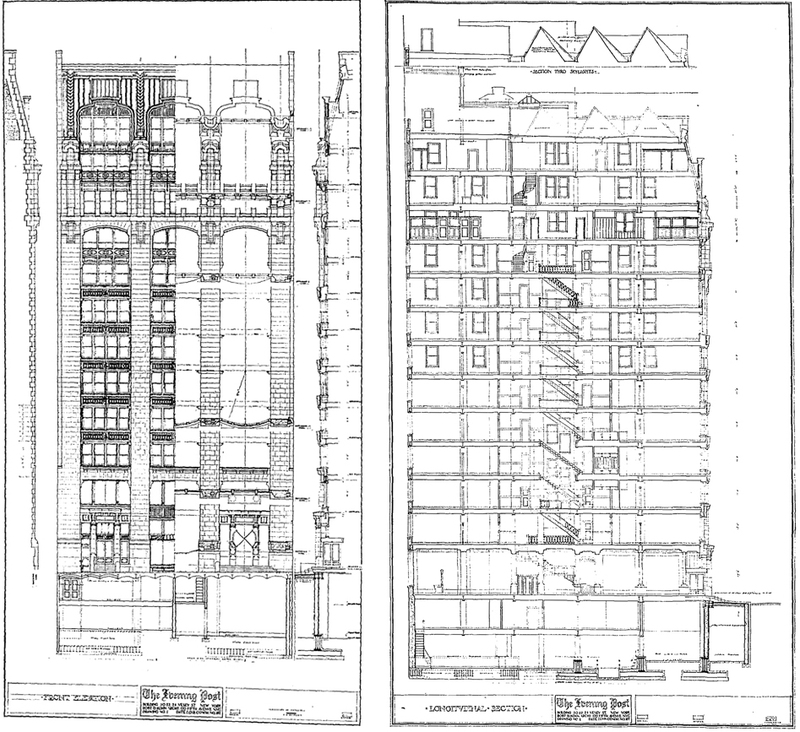 SECTIONS OF THE EVENING POST, 1906 From American Architect and Building News, March 31, 1906. EVENING POST BUILDING, 1926 From New York Evening Post 1801-1925, 1925. The 1906 Evening Post Building at 20 Vesey Street was designed by Robert D. Kohn for the then-owner of the paper Oswald Garrison Villard. Its unusual Art Nouveau ornament on the upper levels featured "Four Periods of Publicity," stone figures by Gutzon Borglum, sculptor of Mount Rushmore, and the architect's wife, Estelle Rumbold Kohn. The building was awarded landmark status in 1965.